Come and do Scottish Country Dancing. It is a social dance in groups. Scottish Country Dancing can be considered as an elegant form of barn dancing like ballroom dancing is the elegant form of dancing in a nightclub. It is fun with a bit of grace. We are a small social club of mostly beginners and we have a mix of teacher evenings and social evenings. You don’t need to be Scottish. You don’t need to bring a partner. All you need is a pair of soft shoes. It costs no more than a cup of coffee and a biscuit – which you get anyway. And to encourage you to come back your second night is free. We meet at the Bullbrook Community Centre in Bracknell, Berkshire, on Thursday nights at 8pm from September to May. The hall has a sprung wooden floor just right for dancing on. Come any night. Phone 0118 979 3024 or click e–mail:contact if you’d like to know more, we’d love to hear from you. About has some answers to what it is and why we do it. In short, it may be seriously addictive – but it’s a great exercise for both body and mind, and it is fun too. Thanks to everyone who came along and made it such an enjoyable evening. Fun for boys and girls on Saturday mornings in Crowthorne, see Notice. Run by a certified teacher. Contact Deborah on 01344 776831. Prefer to dance during the day rather than in the evening? 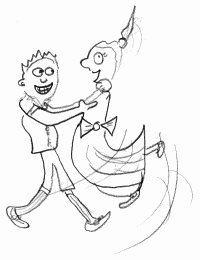 The U3A has Scottish Country Dance classes twice a month in Camberley at 2pm on Tuesdays. follow on Twitter or follow on Facebook for low volume notices of new events in the area and cribs on the Diary page. Updates to this home page and to the resource Dance frequency are made without notice. Get in touch with the club or about the website e–mail:contact.